To make pie crust: in a food processor with metal blade, place the flour and salt, process for a few seconds until combined. Add butter, a few small pieces at a time, continue processing until the mixture resembles coarse meal. Add the remaining cold butter and very small amount of ice water, pulse about 6 times. Pinch a little dough between your fingers. If it does not hold together, add a little bit more water and pulse 3 more times. Transfer the mixture onto a lightly floured surface, knead just a little bit, just enough for the mixture to hold together and feels slightly stretchy when pulled. Wrap the dough with plastic wrap, flatten it into a disk and store in the refrigerator for at least 45 minutes to overnight. Lightly oil the muffin pan (or use muffin liners). Remove the dough from the refrigerator. On a floured surface, roll out the dough into 1/8-inch thick. Using a 4-inch cookie cutter, cut out 24 circles. Place the crust into each muffin cup, cover with plastic wrap and refrigerate again for another hour. Preheat the oven to 400 degrees F. Place pie weights in each muffin cup (or line the crust with parchment paper and fill with rice or dried beans), bake for 10-15 minutes. Remove the weights, prick the bottom of the crust using fork, continue baking for another 5 minutes, or until the crust turn pale golden color. Cool down, but do not remove crust from the pans. In a large mixing bowl, mix blueberries, sugar, salt, lemon juice, lemon zest and cornstarch until well incorporated. Brush inside of each pie crust with egg whites. Spoon about 2 tablespoons of blueberry lemon filling into each baked pie shell. Bake in the oven for 10-15 minutes, until the crust turns golden brown. Remove from the oven and cool down completely. Just before serving, spoon a teaspoon of vanilla yogurt or whipped cream on top of the pies. These are so incredibly cute! And I love that they're made in muffin tins. These are so pretty! I love individual pies and stuff like this because I have a better chance of only eating one serving but these might make that difficult! These are so beautiful! Perfect for spring. These are too cute - what gorgeous photos! 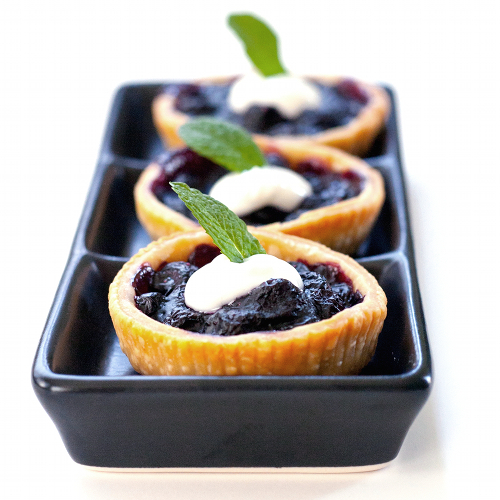 Love the mini pie recipe - bookmarked! These are adorably mini! :) They sound like a massive flavor punch, though, lovely recipe! Perfect little pies made with my favorite lemons! Beautiful little pies. 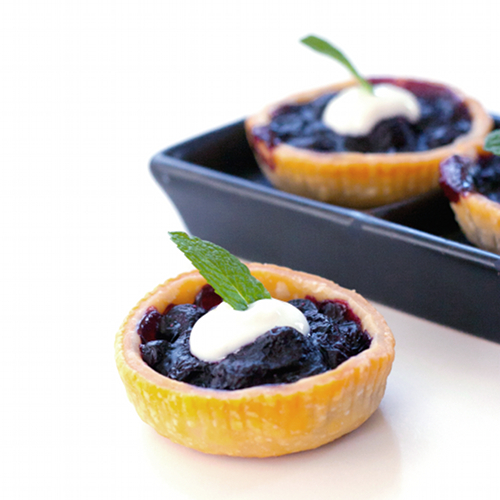 I just adore anything blueberry, but the addition of meyer lemons is fantastic! !